First we have Yana with this super fun card combining Neat and Tangled's A Lot to Say and Thinking of You along with Scrapbook Adhesive's 3D Foam Butterflies. The result is gorgeous! I just love the glitter! Next Anna has a gorgeous layout for you! She used our Sparkle and Shine and Photo Booth sets for her sentiments. And she put a TON of Scrapbook Adhesives by 3L products to use! She used the E-Z Runner Strips and medium sized Dodz for most things she adhered. Then she used the 3D Foam Squares along with the Creative Photo Corners for her photo. 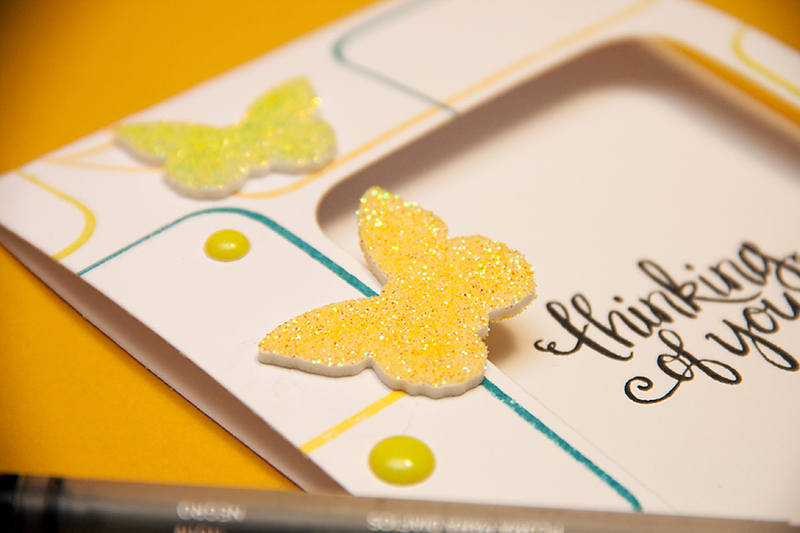 For these gorgeous glittery butterflies she used the 3D Foam Butterflies, and for her gold stars the Adhesive Sheets. Very pretty projects...love the card with the huge window and enamel dots. Awesome projects! Love those photo corners. Fabulous projects, love the glitter!!!! Beautiful projects! Those butterflies look like a lot of fun! Yana made an amazing card! Love it! Love the sweet card Ayana made!! The layout is beautiful! Love the glittered butterflies! Thanks for the inspiration. Very pretty projects. I like the glittery butterflies on both. 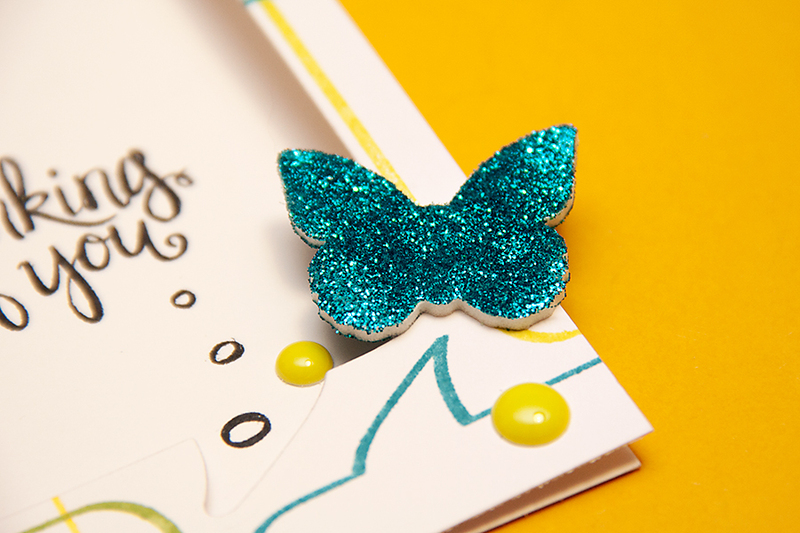 The card is fun, the bright colored paper, the glitter butterflies,the sentiment and I like the way she made the circles going up from he though bubble to make it stand out on that paper! The lay out is so pretty the strip of butterflies is beautiful and so are the glitter butterflies a great way to finish off a page! Love the big speech bubble in the middle of the card. The butterflies are beautiful. Very pretty projects! I'm a big fan of butterflies and glitter, so these projects make me happy! Those glittery butterflies are SO adorable!!!! Love them!!! I love those butterflies!!! very pretty, This girl loves bling and glitter. WOW! These are amazing! Love them! This piece is amazing, thanks for sharing!!! Love those foam butterflies -- Ooooooh, so very pretty! Yana and Anna's projects are both gorgeous! The glittered butterflies are so cool. I really need to get 'A Lot to Say'. I love that layout with the larger piece of cardstock to make the photo seem larger. Gorgeous card and layout! I love the glittery butterflies. Those butterflies are so pretty! Two absolutely stunning creations. I'm smitten with the speech bubble die! 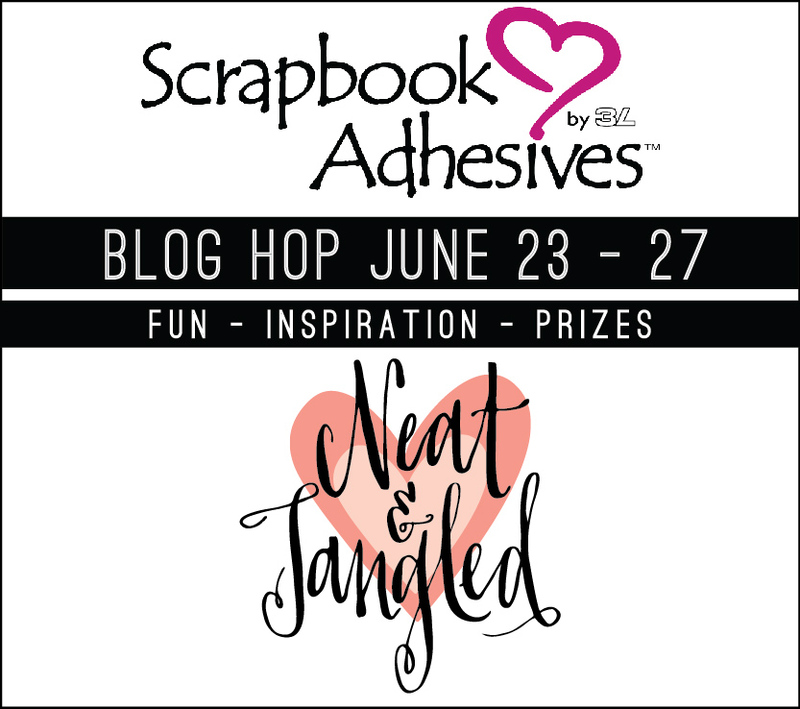 N&T paired with Scrapbook Adhesives is a recipe for AHHH-Mazing!! Wow, LOVE that gorgeous layout and oh that word bubble die! Pretty card and layout! 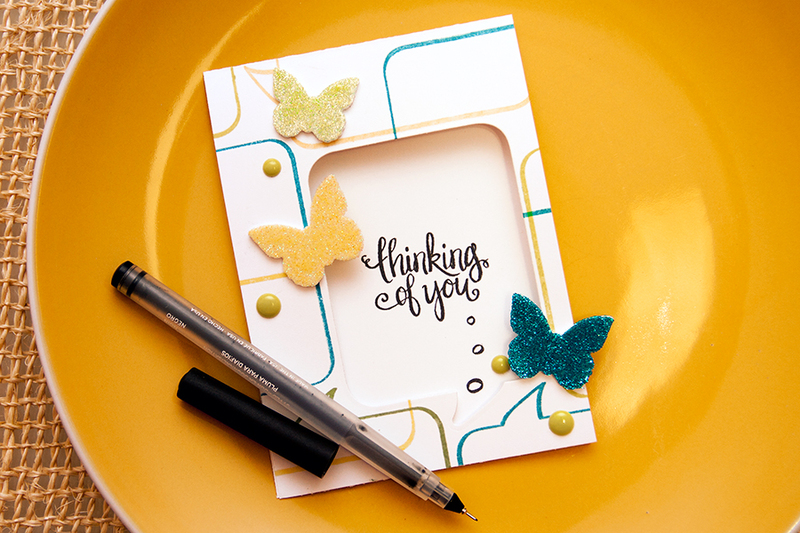 Love the 3-D foam butterflies and the awesome font of the Thinking of You sentiment! Oooooh that card is soooo cool! And that page absolutely sweet! Wow, those butterflies are great! Both cards are so creative! Great use of your products! Those glittery butterflies are delicious!